tax and it’s cheap to live here. Brian: Chicago, IL. my family moved here (Orlando, Florida) when I was five. Jason: March 31st, 2001 is when Yip-Yip started. What is your favorite piece of hardware? Jason: Korg MS-10. I’ve had it for five years or so and it’s the perfect synthesizer. Brian: I just got a Moogerfooger freqbox, so I am pretty excited about that. My Synare PS-1 is probably still my favorite though. Brian: We only use Acid 4.0 and Sound Forge 7.0, that that’s basically all we have ever used, so those are our favorites. How does your environment influence your workflow? Brian: Being surrounded by gear and other fun stuff always helps. Since we moved to a new house, things have been great because we have more room. We can have everything out and ready to use, instead of half of it boxed up in the closet. 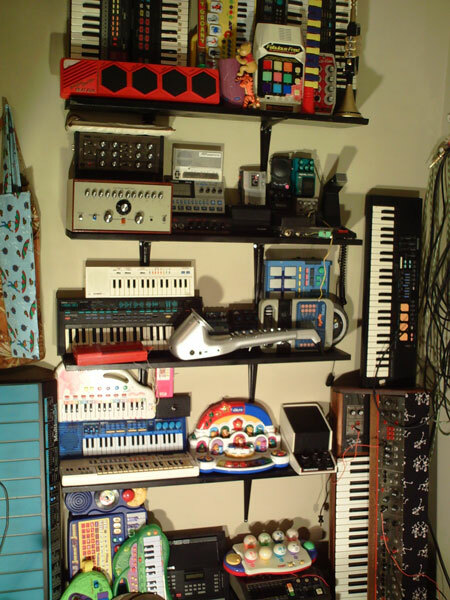 Brian: My first synth was a Roland JP-8000. It was a graduation present from my parents. 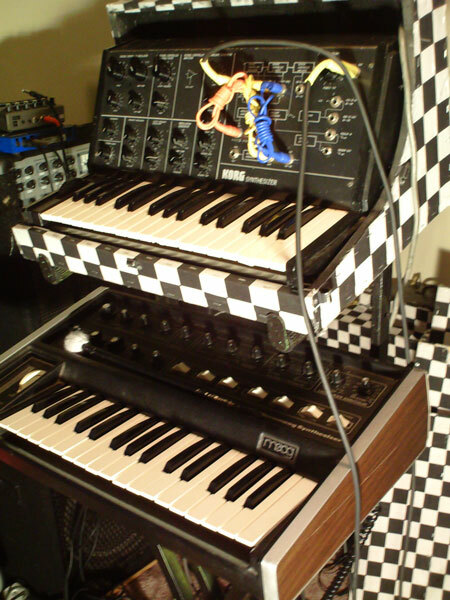 We used it for the first few years of Yip-Yip, until it died and I got a Moog MG-1. Jason: I got my saxophone when I was nine or ten. I played in elementary and middle school. I played it again in high school for a few months when I was in a ska band. It sat in my closet for almost a decade after that. I just started using it again for Yip-Yip. My first synth was a Theremaniacs Theremin I got on ebay about eight years ago. Brian: I’m not supposed to have a wishlist anymore according to Jason and Rachel, but I do still want a gong sheet, a working shin-ei surf/siren pedal (mine came broken), a crash cymbal, an Ace-tone top-1 organ, and the mfos mini-synth plus mini-controller kits. 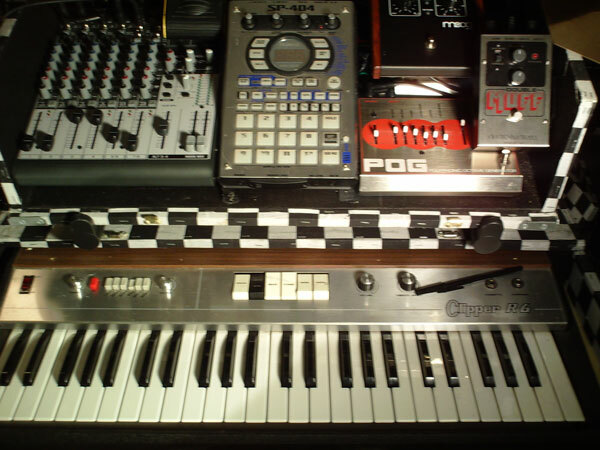 Brian: Yes, my side is a Moog MG-1, a Galanti clipper combo organ, Boss SP-404 sampler, Moog freqbox, EHX Pog and frequency analyzer, Synare PS-1, mixer, cymbals and a gong. Jason: Korg MS-10, MS-01, MS-04, Micromoog, Washburn ax:9 analog delay, Guyatone analog stereo chorus, alto saxophone, Synare sensor, a crummy cymbal, a crummy mixer. Brian: We have had Yip-Yip rooms at the last 3 places we’ve lived. They mostly just get bigger, with more stuff. Jason: We’ve recorded ourselves since we started. We’ve recorded ourselves in seven physical locations.